What's on in 2019 ! A list of events, details below. 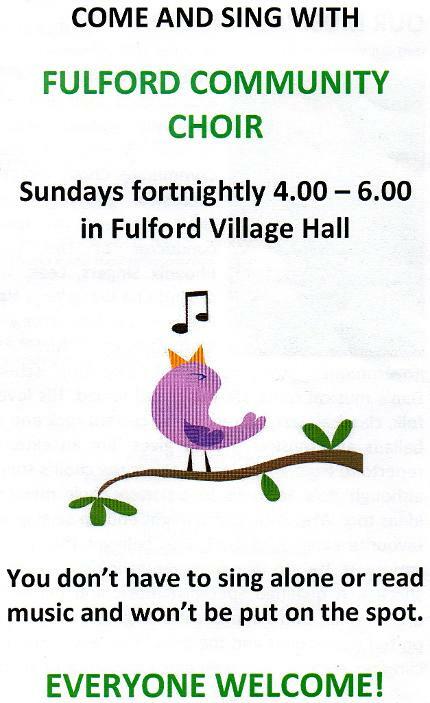 The Fulford Village Walks are an opportunity to explore the wonderful countryside and footpaths which surround Fulford, in the company of both experienced and casual walkers alike. The walks are very informal and an ideal social occasion as well as the opportunity to keep fit and learn more about the history of the village and the countryside, where you can meet lots of different people from around the village. Dogs are welcome on the walks (provided that they are kept under control), except for the Rhodendron Walk and the Dawn Chorus walk. The walks are organised once a month throughout the year (except for the height of summer), and all ages and abilities are welcome. All walks start from the village green at 11am and are generally 2 hours long unless stated (or people are enjoying themselves too much!). Just bring your rake and gardening gloves!! Help spruce up the village ready for Winter. Doors open 7.00 p.m, first dance 7.30 p.m.
Sunday 16th June (1 - 5pm).